SCOT is once more proud to participate in the Burns Supper held at The Country Squire in Kenansville, NC, in true Scottish Tradition. Once more a great evening of food and entertainment is in store. 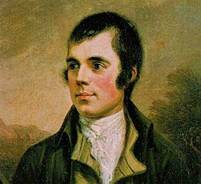 Come along and enjoy this Celebration Honouring Scotland’s National Bard. The Country Squire has maintained the price of the tickets this year at $50.00 per person, which is a bargain for the great food and entertainment provided. Anyone wishing a side order of Haggis with their entrée, add $5. All dinners include a glass of wine, tea, and coffee. For the past several years all SCOT members have received a ticket for an extra glass of wine or beer, and this tradition will continue as a token of thanks to our members for their support. The program will include some great entertainment from The Port City Pipes and Drums, along with some of our own SCOT members, including Ben and Cage Bullard, the young fiddlers who were such a great hit last year…you do not want to miss this event!! SCOT is a non-profit organization dedicated to sharing the culture of Scotland with residents and visitors in the Research Triangle area of North Carolina.